→Can Dust Mites Live in Memory Foam Mattresses and Pillows? Memory foam is often marketed as the miracle substance for all things comfy, from pillows to mattresses and beyond. I have to admit that I like how memory foam feels, too! However, some people say it’s more than just a material to help you have sweet dreams. In fact, some believe that dust mites can’t live in memory foam mattresses or pillows at all! If this is true, than memory foam is an awesome option for anyone who suffers from dust mite allergies. If it’s both comfortable and hypoallergenic, then it’s a win for anyone! However, not everyone agrees that memory foam can help battle dust mites. In the world of dust mite allergies, this is a pretty controversial topic. So, who is right? Let’s examine the evidence and come to a conclusion! Read on for an overview of both sides of the issue. One side of this argument insists that memory foam is just about the worst thing for your dust mite allergies. To this way of thinking, dust mites thrive on the surface of memory foam, and you’ll be in contact with them all night long as they shift between your mattress and your sheets. The anti-memory foam mindset has science in its favor, as least as far as one study is concerned. According to a study conducted by the University of California, Berkley, memory foam – and foam mattresses in general – are actually much worse than ordinary spring mattresses! The study tested mattresses in Norwegian homes. It found that nearly half of foam mattresses tested had dust mite feces on them, while just twelve percent of the spring mattresses had dust mite feces. It’s pretty hard to argue with clearly observable science and hard facts. Numbers don’t lie, after all! Dust mite feces are, of course, dust mite poop. This is disgusting, sure, but it’s also worse than that. It’s a sign of misery for anyone with dust mite allergies or asthma triggered by dust mites. If you take this study as your convincing proof, then you would definitely want to steer clear of memory foam mattresses. Memory foam mattresses, according this this study, are over three times more likely to harbor living dust mites. In total contradiction of the study mentioned above, an article written for Essentia encourages dust mite allergy sufferers to opt for memory foam over every other type of mattress. While the way this conclusion was developed is not as academic as the university study against dust mites, it does make some good points. It also brings up issues not covered in the precious study. For one thing, the article points out, coil and spring mattresses have many spaces for dust, dust mites, mildew, and other gross things to accumulate in. While the surface area of this kind of mattress may have less dust mite poop than the surface area of a memory foam mattresses, we can’t forget about the other areas of the mattresses. The surface is just one part to think about! You also have to pay attention to the inside of your mattress. The cavity inside of coil mattresses may not be in immediate contact with your skin, and it might not be visible, but it is still in your room and it does contribute to the air around you. Your dead skin cells, sweat, and outside contaminates can gather there and stay there for a long time. Other types of mattresses can also be filled with dust mites. Soft, billowy mattresses or mattress covers provide plenty of room for microscopic dust mites to set up house. According to this logic, memory foam mattresses are the best way to go! They don’t have coils or springs, and they don’t have airy spaces for little intruders to hide. 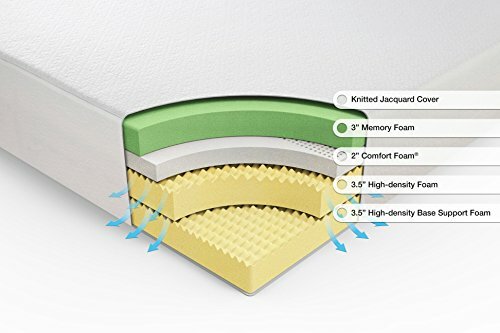 Although they may tend to have more dust mite feces on top, memory foam mattresses will have fewer dust mites overall, and they will also have less mildew and other contaminants. So, which side is right? Is memory foam a dust mite culprit, or is it a weapon in your arsenal against dust mites? I suppose you could take either side with equal technical correctness, but it probably really just comes down to what grosses you out more. The reality is that no matter what kind of mattress you get, you will have some dust mites living (and dying and excreting) in your bedding. Unless you sleep on a cleanly swept concrete slab, you really can’t get around that. So, which is worse? Dust mite poop on your mattress, or a veritable metropolis of dust mites in your mattress springs? If both sound pretty bad to you, then you’re not alone. They sound nasty to me, too. But don’t worry—there is a solution. No matter which of the evils you choose, you can keep the dust mite level as low as possible if you use a hypoallergenic mattress cover. Some mattress covers stretch around the top, while more thorough ones zip tightly around your mattress to seal in the existing dust mites and seal out the ones that might like to burrow into your bed. As far as the mattress question goes, though, you will have to decide that for yourself! I’ve given you the evidence, and now you must come to your own conclusions. To memory foam, or not to memory foam? That is the question.